In the morning we carried our gear down an old, heavily-used dock to our boats. A plank cracked and broke under my weight as I stepped on it and I quickly moved on. It happened twice more. Our host had been on and off the dock casually a few times, and we had unloaded on it the evening before. But by the time we launched, due to forces of nature entirely beyond my comprehension, I’d done quite a bit of damage. With a strong current and an encouraging tailwind we set out across sunny Lac-Saint-Pierre. Unable to see the far end of the lake, we took a bearing and stuck to it. We were only a little off. We passed a buoy with a sign on it. I paddled close to investigate. “Danger. Military Training. Unexploded Ordnance.” My fishing line caught on something and snapped, probably the anchor line for the sign, hopefully not a mine. 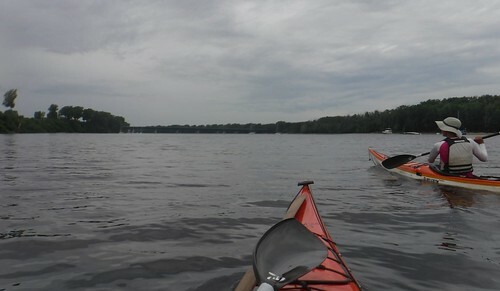 Later, a racing canoe crossed in front of us. Two fit canoeists paddled like blue jays in flight, swish swish swish, change sides, swish swish swish, change sides. A rainbow in the distance turned out to be a bridge over the river leaving the far end of the lake. In Trois Rivieres (pronounced twa) we passed waterfront factories and turned up the Saint Maurice, the river that would take us into the North. A dozen boats sat moored just up the river off of a beach enjoyed by volleyball players and bikini tanners. We asked a leisurely sailor if we might find a shower at the beach’s bathhouse, and he told us it would be worth our while to turn back, continue east on the Sait Lawerence for less than a mile, and spend the night at the marina there. The dock master at the marina was accommodating if not welcoming. We could spend the night, but we’d have to pay five dollars for him to open the showers for us. Our own investigation however found that in the men’s room, they were unlocked. I smuggled Erin in and kept watch while she showered. The dock master asked us not to leave our boats on the dock, so we put them back in the water and tied them up for the night. The residents of the marina were much friendlier. Besides smiles and conversation, they offered us baguettes and olives.